The Raman Effect is named after Sir Chandrasekhara Venkata Raman, an Indian physicist and winner of the 1930 Nobel Prize for physics – the first non-white person to win a Nobel Prize in science. Raman scattering is the inelastic scattering of an incident photon, meaning that the energy and wavelength of the scattered photon differs from that of the incident one. Because of this difference in wavelength, the Raman scattered photons can be detected separately from the excitation wavelength, even though the Raman emission is orders of magnitude weaker than the emission due to elastic (Rayleigh) scattering. Both infrared and Raman spectroscopies resolve vibrational changes within a molecule, whereas ultraviolet-visible spectroscopy (UV-vis) resolves electronic changes due to the presence or concentration of a particular photoactive component. Infrared differs from Raman in that it produces an absorption spectrum; gaps in the spectrum correspond to modes of vibration within the sample. Both Raman and infrared produce spectra that contain a lot of information, and are therefore rarely interpreted on an absorption by absorption basis. Instead, the spectra are used as a ‘fingerprint’ for a given compound, and these fingerprints can be compared to databases in order to find a match. Once an absorption band has been identified, changes in it may be observed while stressing or changing the sample. Raman has two main advantages over infrared: higher spatial resolution and sensitivity to low frequency vibrations. Spatial resolution is increased because Raman uses an excitation wavelength in the near-infrared or lower visible region of the spectrum, whereas infrared uses longer wavelengths in the infrared region. Raman’s shorter excitation wavelengths have a smaller diffraction limit, and can therefore be focused onto a smaller sample than the longer wavelengths of infrared. Raman is currently capable of examining particles as small as 0.5μm in diameter (5μm is a more common commercial figure), whereas infrared is capable of 5μm (10μm being a more common figure). The ability to examine such small particles is becoming increasingly important in the fields of microelectronics and semiconductors, and the market for Raman is growing in these areas. These low dipole, low frequency bonds tend to make up the backbone of a molecule rather than its functional or reacting groups. The vibrations of these backbone bonds are altered when the conformation of the molecule undergoes a change, and changes in the corresponding abortions are readily resolved by Raman. Polymorphism is the ability for a solid material to exist in a number of different crystal structures. It is of interest to pharmaceutical companies; most drugs are fairly large organic molecules, able to fold up and crystallise in a number of ways. Polymorphs may differ in properties such as absorption rate in vivo or ease of crystallisation, but once they’ve been dissolved in a patient’s body, they are completely identical. Of particular importance is the fact that a patent for a drug will cover only one of its polymorphs, and therefore companies manufacturing generic pharmaceuticals can do so without infringing IP rights if they can find a way to mass-produce an unpatented polymorph. X-ray diffraction is the definitive technique for characterising a polymorph’s crystal structure; however, it can be cumbersome and slow. 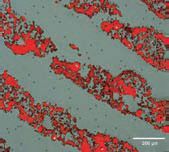 Raman is emerging as a quicker alternative, capable of rapid screening by way of characteristic fingerprints, sensitive to the conformational changes generated by a given recrystallisation scheme. In a similar way, Raman has proven useful in other applications where morphology is important. Copper indium gallium selenide (CIGS, CuInxGa(1-x)Se2) is a semiconducting material suitable for use in thin-film photovoltaic cells. It’s an appealing candidate in the search for ways to reduce carbon emissions. The crystal structure of the material is dependent on the ratio of indium selenide to gallium selenide. Raman is an efficient and sensitive technique to observe changes in the properties of the CIGS as the ratios within it are altered. As Hodkiewicz says: ‘It’s a very sensitive technique when it comes to resolving these changes of morphology.’ Infrared spectroscopy can occasionally reveal conformational changes, but only if functional groups, usually on the outside of the molecule, are folded into the middle, out of view. However, no molecule can fold without it affecting the backbone bonds, and therefore Raman is a more reliable technique than infrared for resolving these changes. Close-up of a fi ngerprint residue with cocaine particles visible in white. Spatial resolution to 5μm was achieved by taking 55,000 Raman spectra using a StreamLine Plus high-speed chemical imaging system produced by Renishaw plc. Image courtesy of Renishaw plc. Because infrared and Raman highlight different kinds of bond, they work well when used together. ‘If you’re looking at completely new materials, or esoteric unknowns, things for which you are not going to find helpful databases, then the two techniques complement each other well,’ says Hodkiewicz. Raman was once a more popular technique than infrared, but around the time of WW2, high-quality, low-cost infrared detectors were developed, allowing infrared to eclipse Raman in popularity. Raman didn’t begin to be used again until laser sources became more affordable. The components necessary have continued to drop in price due to mass applications of laser technology. A Raman system was once around five times as costly as an equivalent infrared system, but now a low cost system may only be two times as costly. More expensive Raman systems generally feature higher spatial resolutions and sensitivity to narrower emission bands, with resolution down to 10cm-1; low-end systems have resolutions of around 30cm-1, which loses the specificity required for morphology studies. The market for Raman continues to grow, mainly in areas where infrared does not provide a good solution. As well as the advantages listed, Raman is particularly convenient when examining samples in glass containers, whereas infrared would not be suitable because of the strong infrared absorption of glass. Similarly, Raman is well suited to medical applications in which the water in living tissue would interfere with infrared; the oxygen-hydrogen bond absorption is relatively weak in Raman spectra. Potential applications include cancer detection through the fingerprinting of cancer markers, and non-invasive blood glucose measurement for diabetics. Medical technologies remain a growth area, as healthcare represents something of a recession-proof industry. Work on developing the market for Raman has thus far been aimed at reducing the ownership cost, and at making the technique easier to use. The technique has two main drawbacks which proponents are trying to address: sample fluorescence and sample heating. Hodkiewicz states that fluorescence is still Raman’s main limitation: ‘When one excites a sample with a laser, the Raman emission is produced, but if the sample is fluorescent, fluorescent emissions are also produced, and these are generally orders of magnitude more intense than the Raman emissions.’ This fluorescence has contributed to Raman’s slow uptake, as it historically requires a degree of expertise on the part of the user in order to recognise and avoid it. According to Hodkiewicz, a particular development focus of Thermo Fisher is on ensuring consistence of results regardless of the experience of the user. The spectrometer software will give warnings of fluorescence, and is even able to correct for mild effects. However, if a sample fluoresces strongly at a given excitation wavelength, the only way around this is to change the excitation wavelength. Newport describes a high-end solution by B&W Tek in which laser wavelength is controlled by a computer. A computer-controlled variable notch filter is used in order to block out the excitation laser, typically 50cm-1 either side of the excitation wavelength. A laser line generator, also computer controlled, can be used to tune the excitation wavelength. While the equipment is expensive, Newport believes that the total cost is lower than that of multiple lasers and the labour associated with changing them and re-adjusting an optical path is eliminated. This allows many spectra at different wavelengths to be taken in the course of a single day. The typical power of a Raman excitation laser ranges from 0.1mW to a few hundred mW. Sample heating is unlikely to be a problem with larger samples as they are able to dissipate heat effectively, but when using Raman in microscopy, small samples may overheat and become damaged by the excitation laser, especially when characterising particularly absorbent pigments. The power of excitation lasers in microscopy is usually less than 15mW, but even these moderate powers can cause significant heating to a micro-scale sample. Often this damage is of no importance, but in applications such as art conservation, it can be very important that the sample is not affected. The limitation is being addressed by developing instruments that are more sensitive and efficient. A diffuse beam can be used, and the results integrated over a longer period of time. Even so, laser power must be carefully adjusted, and the expertise of the user remains an important factor. Over the past 10 to 15 years, a lot of work has gone into surface-enhanced Raman spectroscopy (SERS), and there has been a recent focus of academic research into the technique. SERS involves placing a mono-layer of the sample on either an electrochemically roughened metal surface, or applying nano-metallic beads to a sample. In each case, the Raman signal is greatly enhanced near the surface of the structure or beads. This large enhancement of the Raman Effect allows small sample volumes to be characterised with greater sensitivity than has been hitherto possible. Another technique, tip-enhanced Raman spectroscopy (TERS) uses a fine metal tip to mimic the enhancements seen in SERS. When the tip is combined with atomic force microscopy (AFM), spatial resolution of a few nanometres is achievable.